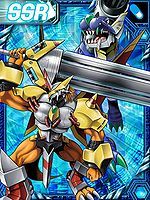 A subspecies of Metal Garurumon, the final form of Garurumon, it is the ultimate beast tank Digimon equipped with the ultimate superdreadnought-class weapon, "Z'd Hou". 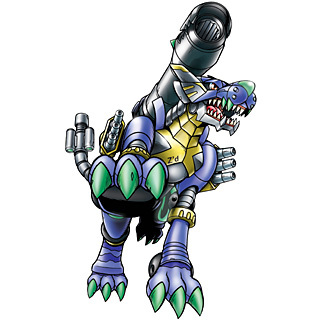 Z'd Garurumon's weapons and ammunition are equipped throughout its body, so its physical strength isn't consumed, and it can sustain a rain of bullets for a long duration. The four Laser Sights on its snout have been improved for its ammunition, and are now capable of locking onto hundreds of objects. Its Special Move is mowing down the opponent by simultaneously firing its ultimate weapon Z'd Hou alongside all of the other weapons throughout its body (Fullmetal Blaze). Also, it can spray explosive energy from its mouth (Blowback Breath). 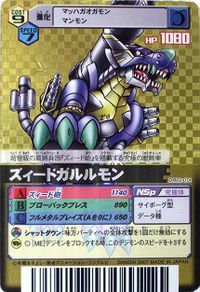 In addition, Z'd Garurumon possesses an evolutionary code that differs from Digimon that were naturally born in the Digital World, and it is thought that it is a Digimon that evolved from a Digitama that was produced due to artificial data intervention. 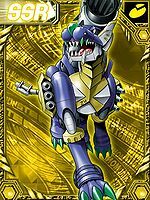 A subspecies of Metal Garurumon, the final form of Garurumon, it is the ultimate beast tank Digimon equipped with the ultimate superdreadnought-class weapon, "Z'd Hou". 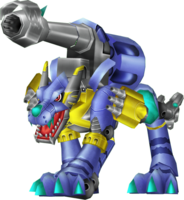 Z'd Garurumon's weapons and ammunition are equipped throughout its body, so its physical strength isn't consumed, and it can sustain a rain of bullets for a long duration. The four Laser Sights on its snout have been improved for its ammunition, and are now capable of locking onto hundreds of objects. 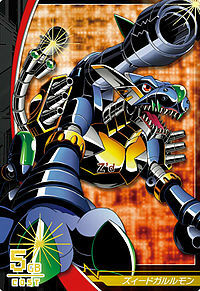 Its Special Move is mowing down the opponent by simultaneously firing its ultimate weapon Z'd Hou alongside all of the other weapons throughout its body (Fullmetal Blaze). Also, it can spray explosive energy from its mouth (Blowback Breath). Title: 「究極の獣戦車」 — "Ultimate Beast Tank"
Z'd is a transliteration of zd (ziyd/zeed), which means "proud"; vowels are not normally indicated in Hebrew writing, hence "z'd". Z'd Hou  Z'd Cannon ズィード砲 Zīdo Hou Zeed Cannon Launches the back-mounted Z'd Cannon. フルメタルブレイズ Furumetaru Bureizu Full Metal Breath A systemic weapons barrage which sweeps across the zone. ブローバックブレス Burōbakku Buresu Blowback Breath Breathes a jet of energy from the mouth. 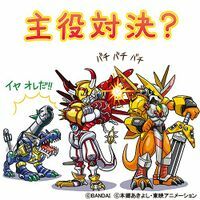 Z'd Garurumon is the partner of Inui Yuu. 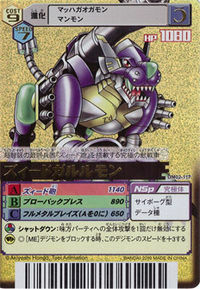 Evolves from Metal Garurumon by Card Evolution. 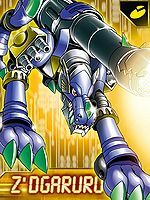 Z'd Garurumon is an available Side Evolution for MetalGarurumon. It can be unlocked if level 65 or above with the item Z'd Hou. 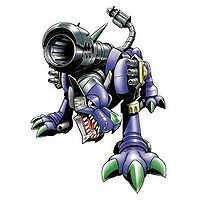 Z'd Garurumon is an obtainable Digimon which is evolved from Were Garurumon. It can also be obtained as a collectible card. 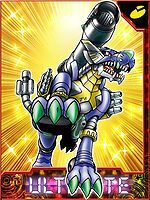 Z'd Garurumon is available as a Digimon Medal. Can be evolved from Piccolomon. 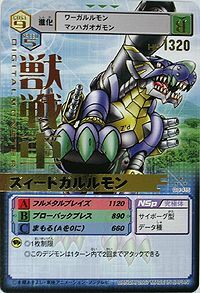 This subspecies of Metal Garurumon is a super-dreadnought beast tank! A subspecies of Metal Garurumon, this beast tank is equipped with its Z'd Hou, as well as many loaded weapons. The laser sights on its nose have been improved for live ammunition use, allowing it to lock on to several hundred targets at once. 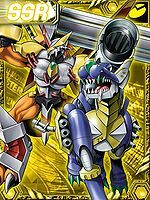 Z'd Garurumon is the boss Digimon in the Round X of the arcade game's second version.